I wanted to share this with everyone (as well as remember it for myself). here are some pictures of a guy who rode his bike from FL to AK! Everyone knows these things. They are normal. They make sense. These units of measure are called Imperial Measurements. Just in case you don’t know, the rest of the world uses the metric system. Actually, according to Wikipedia, there are only 3 countries that do not use the metric system. I don’t like the metric system. Not just because it is different….but because it is less precice. Here is just one example. Here is a whole article on wikipedia about it. So, what do I do? Well, because everyone here uses it, I’m trying to use it too. I’m trying to figure out what a kilogram weighs when I hold it in my hand. I’m trying to guess if it is 25 or 30 outside. I’m trying to guess distances in kilometers. We haven’t bought a set of metric measuring cups and spoons yet, so when we cook we still have to make changes. I use google quite a bit to make changes between types of measurements. One of the blogs I have started reading is called a Yankee in Belgrade. 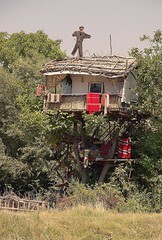 Today they had this picture of this Serbian Tree House. I thought it was interesting and wanted to share it with everyone. Image from Yankee in Belgrade via their blog. Ever need Sunday School Material? Are you a teacher and want to share your materia with someone? Check out the Sunday School Wiki. I can’t speak for their thology so be careful and make sure you read things first. But, it looks like a good idea and one whose time has come. Anyone have an extra $25,000? I’d like one of these. That just looks uber cool. If I had the money, I’d buy it myself. Logos is offering a new commentary of Matthew and Mark for free for a limited time. Don’t have the software? They have a free client you can download and use too. I don’t know aything about the quality of the commentary, so you’ll have to get it and make up your own mind…but the price can’t be beat. Cranberry Sauce. No, not the expensive stuff…the cheap stuff. In a can. That comes out looking like the can. Pumpkin Pie Spice (made of cinnamon, nutmeg, allspice, cloves). We know we can get cinnamon. We have nutmeg. We don’t know about the others.